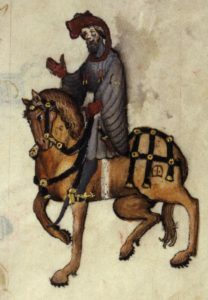 In the General Prologue of The Canterbury Tales, Geoffrey Chaucer introduces the worthy and virtuous Knight, as one who ‘loved chivalrie,/Trouthe [truth] and honour, fre[e]dom and curteisie [courtesy].’ (lines 45-46). He stresses the knight’s crusading heroics, saying that he had ridden ‘As wel in Cristendom as in hethenesse [heathen areas]’, fighting at ‘Alisaundre…whan it was wonne’. The dramatic capture of the Egyptian city of Alexandria in 1365 by Peter of Cyprus was one of the great crusading victories of the fourteenth century. The Knight was also present ‘In Gernade at the seege eek hadde he be/Of Algezir’, probably a reference to the 1344 siege of Algeciras. Going on to namecheck other famous crusading battles, Chaucer is making it clear to his audience that the Knight is a warrior to be greatly respected, who spent his youth engaged pious and honourable acts. As he was writing in the late 1380s, these past glories also underline the Knight’s great age. Chaucer’s original audience would have immediately understood the verb reysed, although the term is a Middle German one. The Reisen (journeys) were the seasonal campaigns conducted by the Teutonic Knights of Prussia in the ‘heathen’ Baltic regions and western Rus. The Teutonic Knights attracted enthusiastic volunteers from all across Europe, all arriving ready to fight (and so saving the Knights a great deal of money, as then they did not have to raise professional armies or buy expensive military equipment). In return, the Knights offered the perfect crusading package tour. You could stay for as little as a few weeks, or for months at time. The Knights provided guaranteed fighting against pagan ‘infidels’, so everybody could go back home and boast about their military exploits. In the frozen wastes of Lithuania in the winter, with even rivers and marshes iced over, it was impossible to fight pitched battles. Instead, short-term tactical raids or reysas were the order of the day. You could go out to fight for a few days or weeks, before returning to the warmth, safety, good food and on-site entertainment provided at the Order’s castles, especially at Königsberg (now Kaliningrad in Russia) or Riga (today the capital of Latvia). And if you didn’t fancy joining that day’s reyse, you might go hunting. 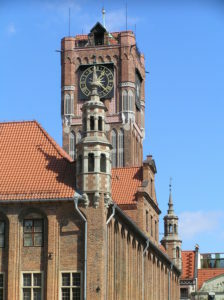 Or you might go and visit a large town not too far away from the heathenesse: places like Marienberg (now Malbork in Poland), Thorn (now Toruń in Poland), Elbing (now Elbląg in Poland) or Danzig (now Gdańsk in Poland). All of these towns were large and thriving centres. You might visit only to buy horses and supplies for your next reyse. But you could just as easily go shopping for luxury goods and souvenirs. 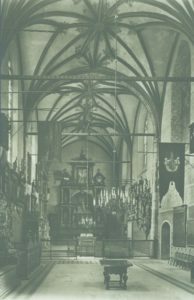 Or you might spend some time visiting shrines and churches, such as St Mary in Königsberg, full of memorials to nobles killed on the reyse. 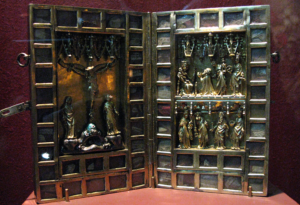 Piety was an important part of the reyse, with most crusaders attending daily Masses. The Teutonic Knights organised their reysen not only for when the terrain was passable, but around the major feasts of their patroness, the Virgin Mary, such as the feast of her Purification (2nd February). After the raids, or in the more extended summer campaigns, the prolonged sieges, the crusaders could enjoy feasts and banquets galore. There were regular special prizes to be won, awarded for noble deeds and daring chivalric feats. Most coveted was a place at the Ehrentisch, the table of honour sat in by Chaucer’s Knight. So after a short season away from home, the keen crusading knight would arrive back at court with useful ‘combat experience’ to put to service in his king’s wars, some thrilling stories and things to boast about, interesting souvenirs, many new friends and even some useful contacts abroad. This might make time on the reyse sound like the perfect student gap year for medieval nobles. And a campaign or two with the Teutonic Knights was certainly seen as a useful military apprenticeship, quite apart from the spiritual prestige that it conferred. But in fact, families would often travel together. Young noblemen were also likely to go on the reyse at a much earlier date than we might imagine. William Beauchamp and his brother Thomas went on crusade in Prussia in 1365, when he was just eleven years old. In contrast to other medieval theatres of war, the reyse was relatively safe: someone as small as William would have been protected by a heavily-armed retinue out in the field, and left behind in the Order’s castles when necessary. Yet as Timothy Guard points out in his recent study, this wasn’t even William’s first crusade. The year before, aged just ten, he had been present at the battle of Nájera. When we are thinking about European court cultures, this aspect of courtly life can be easily forgotten. Edward III of England took part in his first battle at the age of fourteen. For all the courtly fun and games of knights competing in tournaments dressed as Tartars, or banqueting at the Ehrentisch, these men had been fighting since they were children. 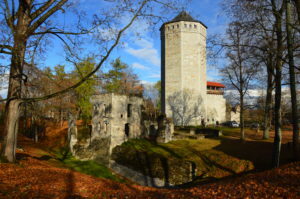 Not all of the Teutonic castles still exists. Sometimes there are only ruins, but even the ruins may be interesting. Especially when you correlate it to history. I recommend visiting these castles.